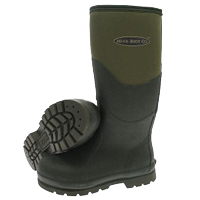 Muck boots are a comfortable, high performance footwear designed for work in tough, messy conditions. 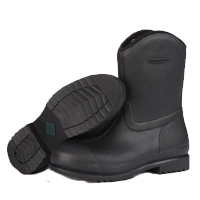 We’ve got several styles we keep in stock year round to meet all your work boot needs! -40 F – 60 F temperature rating. Unisex (fits women sizes 6-13, men 5-15). High and mid height options. Stretch fit top keeps the cold out and heat in. Double reinforcements on instep, heel, and achilles areas. 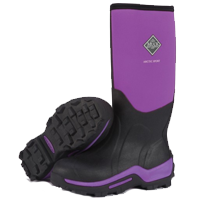 5mm CR flex-foam bootie with four-way stretch nylon. 100% waterproof, 2mm thermal foam underlay. 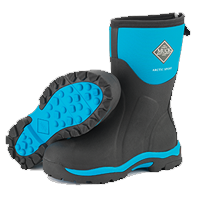 Professional extreme conditions sport boot. -60 F – 40 F temperature rating. Double reinforcements on instep, heel and achilles areas. 8mm CR flex-foam bootie with four-way stretch nylon. Also available with steel toes. Sub-freezing to 85 F temperature rating. Unisex (fits women sizes 6-13, men 5-16). Stretch fit top keeps the cold out and the heat in. 100% waterproof, quick clean rubber overlay.